Traveling light…just me and the baby! Flying cross country with just me and the baby? That’s practically as easy as traveling alone! Of course, I didn’t feel that way when my oldest was born… it takes traveling with the whole family, 2 carriages, 3 carseats, 8 carry ons, 6 checked bags, 2 diaper bags, 3 food bags and a few other random pieces to make flying with just the baby seem easy. Unfortunately, it wasn’t for a happy reason; I was going to visit my family after my grandfather’s passing. I wanted to go, I needed to go, and flying with just me and the five week old baby wasn’t so daunting at this point in life. I was traveling light, after all; just the baby, the carseat, the Carseat Canopy and J.J. Cole fleece lined cozy bundle-me to combat the frigid east coast weather, the Graco Click-Connect wheels for the carseat, my overstuffed diaper bag, my handbag that barely closed and weighed more than the baby, my Baby Bjorn in case I didn’t have a seat for the carseat on the plane and my carry-on. I was being gone for barely 48 hours, I didn’t need much. I checked in at the counter, doing my best to elicit some motherly empathy from the representatives for this brave mom flying with the baby. They weren’t all that empathetic. Instead they told me that coming January 15, you can only take one carriage piece with you to the gate. 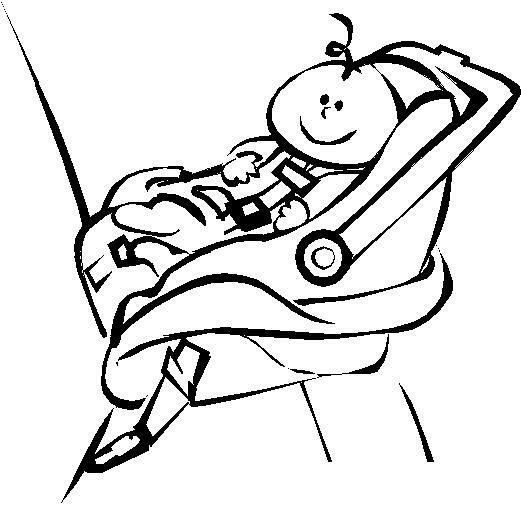 I looked at them blankly, pointing to my Click Connect-carseat contraption (the best thing since sliced bread). Umm, someone obviously is a bit clueless about traveling with a baby. Someone either doesn’t know what they’re talking about, or this is the work of the Surgeon General who is out to make moms across the country lose their sanity. I file away the info to google later, and continue on my way. Although I know that the baby needs to come out of the carseat for security, I pretend I don’t. He’s in a deep sleep, can’t they see? Don’t they know you don’t wake up a baby when they finally fall asleep?? I think they’re talking to me. Only to walk through the metal detector and 30 seconds later reassemble it all back together, only this time the baby is not sleeping. I don’t like going through security. It does not make me feel secure. It makes me crazy. Off to the gate, still silently praying I’ll have that extra seat near me on the plane…I approach the desk…and there’s no seat for the carseat on the plane. Oh there is a seat, if I want to buy one. No, I don’t want to buy one..
Baby Bjorn, here we come. I’m not a big baby-carrier fan. I find them quite restricting and borderline claustrophobic. But Baby Bjorn it was. I started the strapping process, eight clicks in total, and baby was secure. I couldn’t breath, but that’s not relevant. Baby was comfortable. I could barely bend down to get the diaper bag and handbag on my shoulder. I felt more like a walking baggage rack than anything else. I leave the carseat at the door, and then stop. The Carseat Canopy and the bundle-me…it needs to come off if I ever want to see it again..
And so, velcro by velcro, I disconnect it alI and add the two pieces to my ensemble, somewhere between my elbow and my shoulder. I make my way onto the plane. Of course, I’m in row 30…and so I try to pretend no one is staring at me as I make my way down the aisle, diaper bag tapping each person on the head. I sit down and stay still, trying to figure out how I’ll manage the flight. It’s the first leg of the trip, only an hour until the stopover. I just stare at her, because now that I’m stuck in this carrier, I have no idea how to get out. She’s obviously never been inside a carrier; once those 8 clicks are clicked in place, it’s pretty much as a part of you as your head itself; there is certainly no sliding it over. I smiled and thanked her for her sweet advice, with a “it’s not so simple” half laugh. Only half a laugh, because I didn’t think it was all that funny. And so I started unclicking. I silently hope that the baby won’t have to nurse during this flight, because as experienced as I am, I couldn’t figure out how I’d do that. And the flight went well, other than the fact that I couldn’t reach my food bag at my feet. Off the plane and time to reassemble; click stroller base open with one hand, click in carseat, unstrap baby from carrier and breather again; on goes my bags in perfect order; I’m good at this by now. Off to the the next flight; I make my way over to the ticket counter. And Otto is my hero of the day, we get a seat! Actually, a whole row! I settle on the plane, feeling as if I won the lottery. Fewer things can make a mother happier than having an extra seat on the plane. It’s good I traveled light; with a whole row to myself, there was room for everything.